The 6th Annual Toronto After Dark Film Festival, 8 Nights of Horror, Sci-Fi, Action, and Cult Movies runs Oct 20-27, 2011 at the Toronto Underground Cinema. For complete festival info visit www.torontoafterdark.com. The guys at Astron-6 are back for the second time at the 6th annual Toronto After Dark Film Festival. The first helping was the deliciously over-the-top Father’s Day which must have been one of the crowd favourites of the festival. This time around the visuals resemble an old cd-rom game, the acting is cheesier, and the spirit of fighting games has been channeled to create some epic showdowns. Before I get into Manborg I would like to discuss the impressive short that preceded it, Ethereal Chrysalis from writer\director Syl Disjonk. Disjonk introduced the short, saying that the imagery we were about to witness was the product of his nightmares. He wasn’t lying. Ethereal Chrysalis really reminded me of Dante’s Inferno, and the otherworldly work of Clark Ashton Smith. In addition to this, there is even a character who is reminiscent of the notorious occultist Aleister Crowley, in more ways than one. Disjonk has done a remarkable job creating a nightmarish world complete with amazing special effects. I hope he continues to be haunted by nightmares, so I get to see more of his films. Do I really have to explain the plot of Manborg? It sounds like your typical computer game from the early 90’s. The Hell Wars have been going on for years. Draculon, the military leader of Hell is up to his usual business, slaughtering human soldiers and then sucking them dry. But when he kills a seemingly harmless soldier, he starts a chain of events that delivers the human race’s final chance at salvation, Manborg. Half man and half…borg, Manborg has a devastating arsenal and at least 128-mb of ram, enough to take on Draculon and the armies of Hell, but has he been assembled in time? Manborg is a tribute to old computer games, fighting games, and most importantly VHS movies from the 80’s. Like Father’s Day, every member of Astron-6 is involved in some way. For the most part this is Steven Kostanski’s film, as he directed, while sharing writing and some special effects duties with Jeremy Gillespie. Kostanski’s love of movies and computer games from the 80’s and 90’s is readily apparent. #1 Man (Ludwig Lee) is an out of place and badly dubbed martial artist dressed like Johnny Cage from Mortal Kombat; Justice (Conor Sweeney) is a ridiculous vigilante with a bizarre gun stance and a hilariously awful Australian or New Zealand accent (I heard both); finally, Manborg (Matthew Kennedy) is armed to the teeth with weaponry from old first person shooters. In other words, Manborg is nerd video game/filmmaking heaven. Also, Jeremy Gillespie’s performance as the Baron, much like Sweeney’s portrayal of Justice, has some real comedic flair. Astron-6 films may feel like a bunch of your high school friends decided to make a movie, however real individual talent can be found with each member. 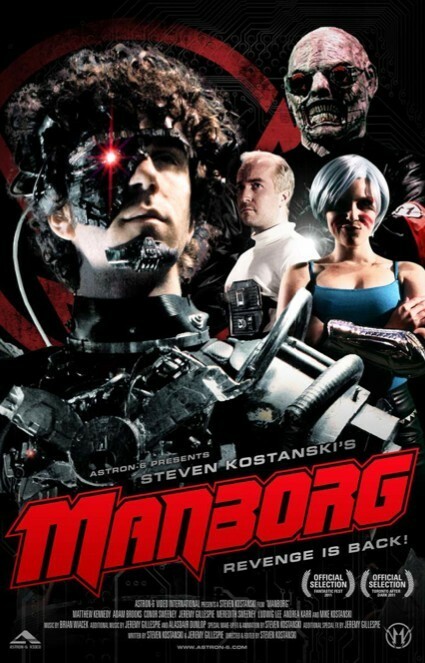 If you’re on the fence about checking out Manborg, just understand that seriousness and incredulity must be left at the door before watching this one. If you can do that, and you can find an audience to watch it with, then I am sure you will find something to like about Manborg. It’s a fun movie, and you get to see what the Astron-6 guys were up to three years ago, before they completed the highly entertaining and boundary pushing Father’s Day. to break it down about manborg would be if your looking to kill time but yet have a fun time then you should for sure check out manborg.